Joe Nzingo Gqabi was born in 1929 in Aliwal North, Cape Province. He completed tenth grade and found work as a construction laborer after coming to Johannesburg in 1951.Gqabi joined the African National Congress (ANC) in 1952 and later the underground Communist Party. At the same time he also joined the Johannesburg based militant newspaper called the New Age as both photographer and reporter. His job of exposing the hidden crimes of Apartheid proved a remarkable experience in investigative journalism. Gqabi was one of two thousands political detainees after the 1960 PAC-led Sharpville Massacre and the consequent State of Emergency in 1960. In 1975 he completed high school and earned a bachelor's degree by correspondence from the University of South Africa. In 1961 he went into exile to join the newly formed military wing of the ANC, Umkhonto we Sizwe. He was later captured in Southern Rhodesia (now Zimbabwe) and sentenced to two years’ imprisonment for leaving the country illegally. Upon completing his prison term, he was re-arrested and charged under the Sabotage Act. He was convicted and sentenced to ten years’ imprisonment on Robben Island, where he served his sentence together with prominent ANC political prisoners such as Nelson Mandela, Walter Sisulu, Govan Mbeki, Ahmed Kathrada and others. In early 1963 he was arrested in Northern Rhodesia in the company of a group of MK recruits and deported to South Africa. Following his release, Gqabi was served with a restriction order. However, this did not deter him from political activities. As the 1976 Student Uprisings was approaching, he guided and advised students and the youth.Gqabi became chief defendant in the 1977 “Pretoria Twelve Trial” that attracted wide attention in the country and world-wide. He and six comrades were acquitted, while other accused received sentences ranging from 6 to 18 years’ imprisonment. He clandestinely skipped the country to join the ANC’s external missions. He was appointed as ANC representative in Zimbabwe after the country obtained independence in 1980. 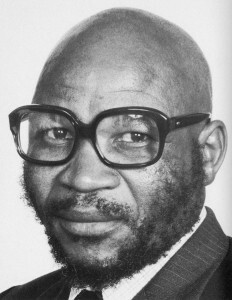 In Zimbabwe, he managed to develop a remarkable rapport with the leadership and people of Zimbabwe.Gqabi avoided arrest until December 31,1976.it was a tribute to Gqabi's relationship with the Soweto students that three who were crucial witnesses refused to testify against him in the resulting "Pretoria 12" trial,a vital factor in his surprising acquittal in April 1978. Gqabi was gunned down by members of the Apartheid hit-squad on 31 July 1981, when he was shot nineteen times while reversing down the driveway of his house in Harare, Zimbabwe. He was given a state funeral by the Zimbabwean government. At his funeral the late ANC president Oliver Tambo said: "To say the enemy has struck us a blow is to tell the truth".His killer was apprehended by the ANCbut never charged.At the time of his death Gqabi was a member of the ANC's National Executive Committee and of its Revolutionary Council,and some within the ANChad speculated that he might eventually be a successor to Oliver Tambo.His body was exhumed in 2004 and brought to South Africa for reburial in Aliwal North.He is survived by his wife Aurelia and two sons, Jomo and Nkululeko.